Coming from a family with over twenty years serving the gelato and frozen dessert industry throughout the USA, it’s only natural to develop a passion producing only the best gelato, sorbet, yogurt and superior frozen desserts. As a child, I was lucky to be able to travel to Italy and that exposure to Italian craftsmanship, presentation and pride has stayed with me. Attending trade shows, international competitions and gelato store openings presented a unique opportunity to understand what is required to be the best. In 2015, Matt’s Gelato was opened with a simple goal, a dedication to produce exceptional gelato and frozen desserts and to share my passion. Since opening Matt’s Gelato, we have been fortunate to work with many couples as they celebrate their weddings, birthday parties, corporate events, and other festivities. 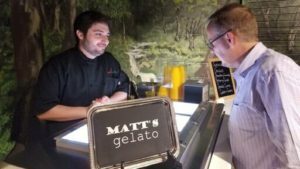 In addition to catering and event participation, Matt’s Gelato also works with local retailers to provide wholesale gelato for their customers and foresees this activity as a focal point for the future.